This hasn’t been an easy year. For some critic types, (i.e. the successful ones), I think it might be simpler to get across what usually takes me hours to come up with, as ironically, I’m my own worst critic. It’s not often that I’m happy with what I write, the conclusions I draw or the opinions I offer and, because of that, I tend to torture myself with albums before I’m able to actually sit down, take a breath, and type something out that may or may not offend. It’s possible that I took on more this year than I should’ve, so some albums slipped through the cracks. 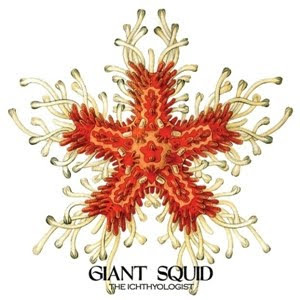 I acquired The Ichthyologist around March of this year through Giant Squid’s Myspace page before they were signed to Translation Loss. This album was re-released by their label in August with a vinyl version put out by Vega Vinyl and, apparently, the mixes were modified. 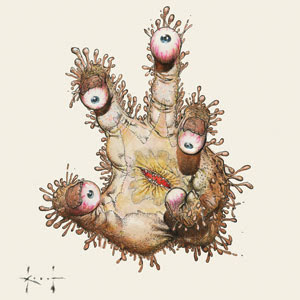 Largely built on the same progressive metal foundations that drive most of today’s better known bands, (no surprise the album was produced by ex-Minus The Bear member Matt Bayles, whose producer credits include ISIS and Mastodon), Giant Squid’s The Ichthyologist is obviously ambitious, incorporating an air of gypsy-tinged musicality that embeds itself in the band’s orchestrated six-string crunch. “Panthalassa” snarls, sings and grinds itself into some mutated rock opera with trumpets a-blast and tonsils a-flarin,’ leading to the sonic strain of “La Brea Tar Pits” and noir-ish “Sutterville.” In what could be perceived as a three-act play, these tracks easily sum up most of what you’ll hear as the album continues. Not to discredit Giant Squid, or say that they dip their collective big toe in the “formulaic” pool, but The Ichthyologist is mostly gorgeous textures (“Dead Man Slough,” “Sevengill”) clashing with aggressive ones (“Throwing a Donner Party at Sea”). Their perspective is eclectic enough to qualify them as a “progressive” band, sort of like Mr. Bungle’s California where category is an understatement more than it is an expression. Giant Squid burn when they have to, but their efforts at aggro seem to distract from what is otherwise a beautifully composed album. 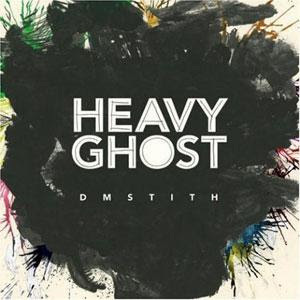 If Robert Wyatt and Cat Stevens (in his pre-Rushdie hate days) were no longer with us, I’d be convinced their souls fucked and bred David Michael Stith whose debut album, Heavy Ghost, walks the same ethereal path as Rock Bottom, though in a more doom-laden dance of piano strokes and melody. Heavy Ghost is a heavy trip full of nervous intensity. You sort of take that into consideration as the haphazard and rapid slap-percussion of “Isaac’s Song” or the domino-tumble of sounds during “Pity Dance” allow you to drift in an uneasy stream of his consciousness. It would be easy to imagine wind-blown candles breathing smoke in patterns similar to the percussive motions Stith takes with the rumbling “Creekmouth” or the high inflections he coaxes from his throat in “Thanksgiving Moon,” as life’s chaos seems the album’s prime inspiration. Stith at one point sings during “Pity Dance,” “I’ve been sleeping with the lights on since I left you.” You can only assume that to be true, but it wouldn’t surprise me if it were. Drawing from Russia, out-of-body travel and Stephen Hawking for its concept, (huh? ), Mastodon followed up the amazing Blood Mountain with Crack The Skye, the rather epic journey of a paraplegic whose out-of-body experience leads him lost in a wormhole and in need of assistance from Rasputin’s body to get back to the physical world. Maybe that sounds laughable, and it probably is. 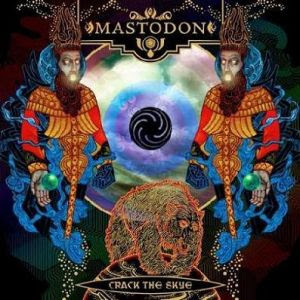 Crack The Skye however is delivered with such energized and aggressive fortitude, the album’s premise seems like a matter of life and death. I was fortunate enough to see Crack The Skye played live in its entirety at the beginning of November. Mastodon seems infallible on stage, the material as overwhelming and mesmerizing live, as it is on wax, unwilling to let their skill get in the way of their passion. Despite their calculating precision, it’s the emotional aspects of their music that seems more substantial than talent or ability, a rarity for a progressive band. With “Oblivion” the band manages to ease the listener into the album before the dramatics really manifest with the hyper-aggressive, “Divinations,” and the desperate immediacy of “Quintessence.” “The Czar,” one of the album’s two larger tracks, (the other being the album’s finale, “The Last Baron”), fades in and out of hopelessness like Crack The Skye’s wandering soul. So far, Mastodon can do no wrong. Crystal Antlers’ Nuggets-borne psych punk is loud and possibly the most fun you can have with a sore throat and swollen glands, singer Jonny Bell less a screamer and more of a choker. At times Tentacles feels as though the band were constantly looking for rhythmic patterns for the organ to tackle, the guitar-bass-drum elements not doing too much to deviate from the plot. 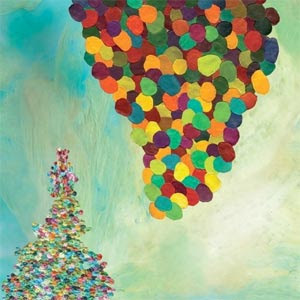 Standing out with an air of introspection, “Andrew” and “Vapor Trail” sort of wallow and trip amongst the psych n’ roll. Still, the heightened swirl of “Time Erased,” the title track’s “21st Century Schizoid Man” moment or “Memorized” with its trumpeted outro, Crystal Antlers set out to make an album that reeks of 60s pop and 70s proto-punk abrasion, successfully illustrating what 60s radio would’ve sounded like in hell. Capitalizing on the same aesthetics that make “Louie Louie” essential, Tentacles is a great listen and that’s really all it has to be.